**The race starts at 1pm Tuesday July 11 Sydney time (this is 8pm July 10 Nevada time). Adams wave starts at 9:30pm which will be 2:30pm Sydney time on Tuesday. Grant Maughan’s wave (the fasties!) will start at 11pm local or 4pm Sydney time. Hello 2017 STYR Labs Badwater 135 competitors and crew members! There will be lots of ways to follow all the race action at the world’s toughest foot race, so please bookmark these pages, follow our various social media feeds, and spread the word to your family, friends, and running clubs! This race is awesome. Whether you race, spectate or crew, there is something for everyone. Was overly anxious about this race all week leading into it. Number 1 son had been unwell and my sleeping patterns had been quite broken. Work was insane all week. My right ITB had been giving me grief just walking down stairs and all wanted was for the race to be over by the Wednesday beforehand. I worked at the UTA Expo the day before the race. 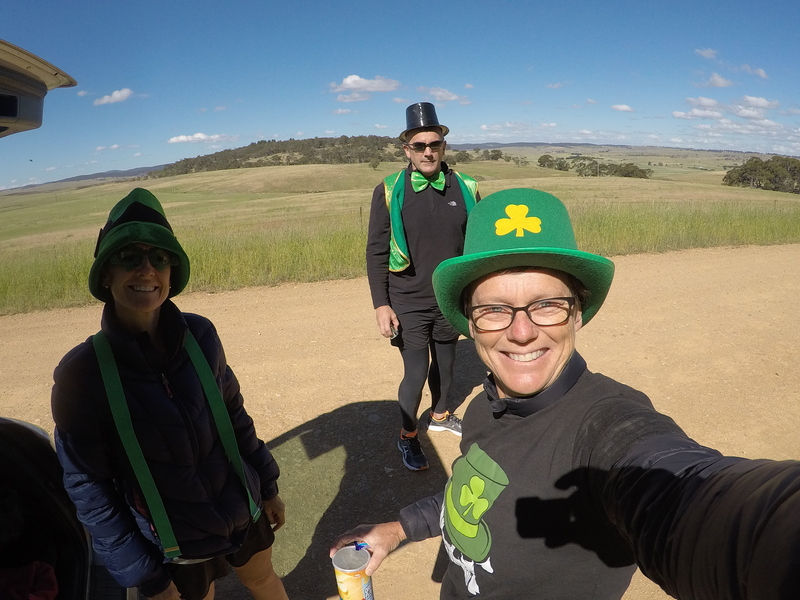 Whilst it was great fun, it may not have been the best idea to stand up all day, the day before a 50k race. Dinner was very late, but I was hydrated through the day, which turned out to be a good idea as race day was quite warm. 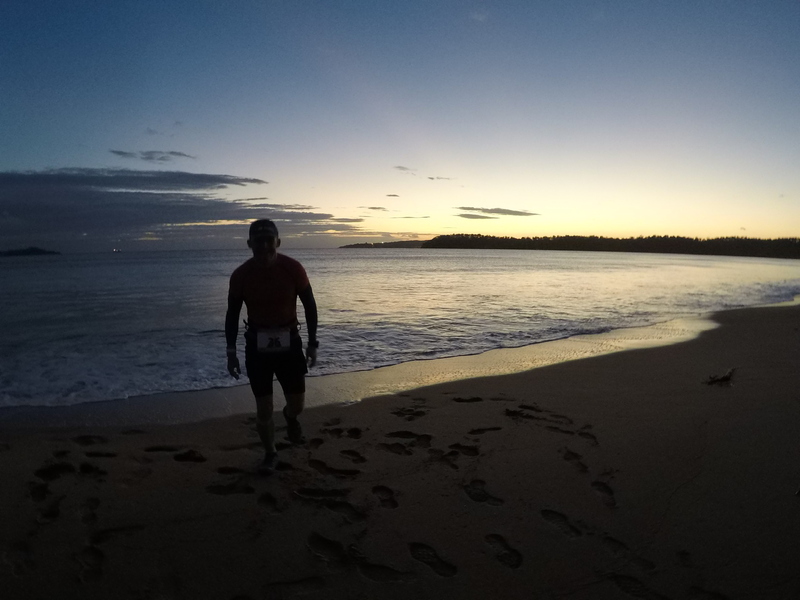 Thanks to the Noosa NUTRS, we had accommodation very close to the start. Race morning dawned after a terrible sleep (perfectly normal for most runners I hear). The start was heaving by the time we got there at 6am. Such a great sight to see! Anxiety levels were peaking and after some wise words from Summit Sister Bek , took myself off to watch the 100k runners come down road to see Adam and all the others that were running. Did some warm ups while chatting Belinda Allison in the car park. A few yoga moves later, anxiety was done to more manageable levels and I was taking off my jacket in preparation for the start. I was really happy to be in start wave 4 this year. Started at the back with some of the Summit Sisters, took off a bit too fast through the crowd and up the hill (Note next year start in the middle of the wave and listen to what others say!). First 5 k is on road to spread out the field before going down the Giant Staircase. It’s a bit of a killer as its quite hilly. Good warm up though. Passed back through the start area and waved to all my friends were crewing and spectating this year – such a boost to the ego to hear your name called! Gavin Markey made me giggle using the road cone as megaphone!! Classic. That image stuck in my head for quite a while. Through to the Giant Staircase via Clifftop walk – again probably a bit fast. I don’t know if it happens to everyone, but there was a runner who kept running and walking and just annoyed the crap out of me. I suddenly realised that it was not their fault and soon settled down into a good rhythm. Top of the Giant staircase and no lines, just a few people making there way down at a good pace. Had the lovely Tom behind me, who talked too me all the way down the slight scarier bits (I’m not good with heights). He was fantastic. 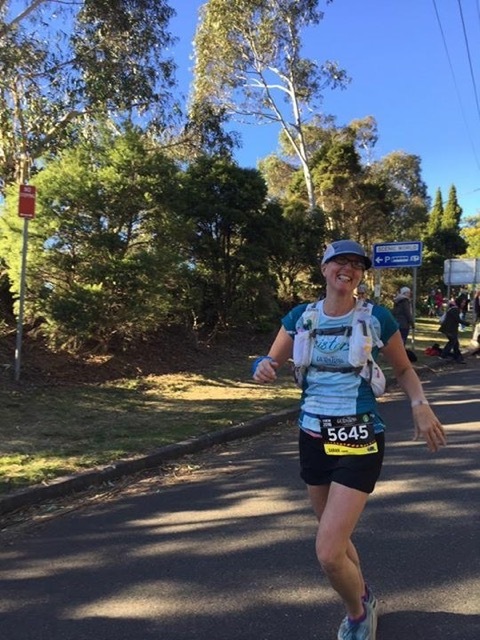 Running through the Leura forest (my favourite bit!) and a guy in front came down. Everyone stopped to see if he was OK, he said he was fine, so the conga line kept going. I mentioned to the vollie and the medic a bit further on, that he had come down and may have done an ankle. I heard a bit later on that someone had shattered their kneecap and had to be airlifted out. Hopefully it was not him. Stomping up the stairs out of Leura Forest and I start to see a few Summit Sisters ahead. The single track of this part of the race, I love but today my legs were very heavy and it was a struggle. This part of the race was the only place that I experienced a slight delay with the stairs. Other runners were very good about letting you past. Through Gordon Falls to the cheers from Bek, Sharon and other Summit Sisters who were being the world’s most awesome support squad. Got caught up with a much faster runner and stuck with her for about, oooh 500m, and then let her past. She was fast. 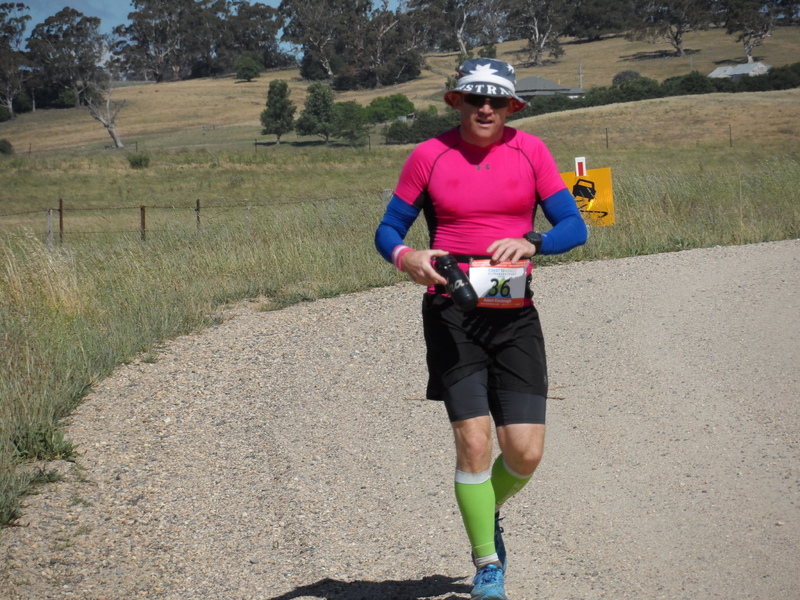 The highlight of this part of the race was getting to use a proper toilet at Conservation Hut. 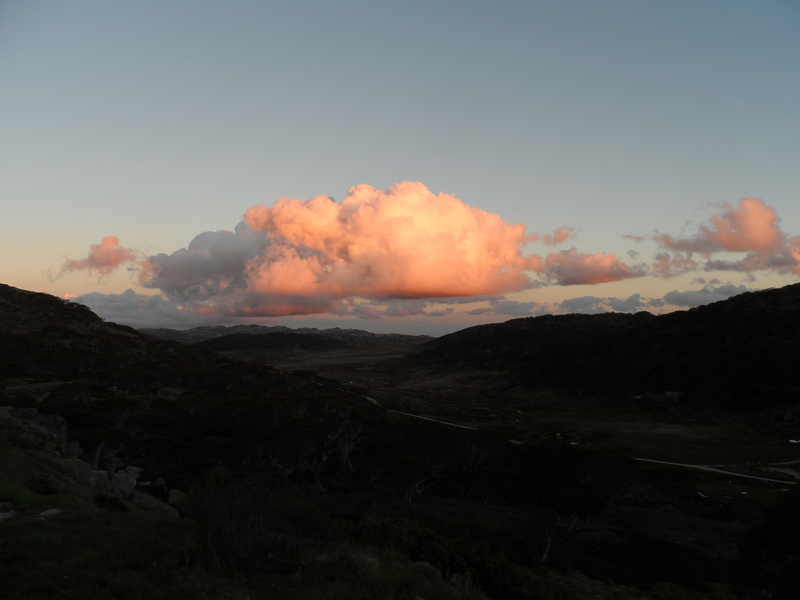 It was nice to sit down too…. Got some lovely support from the Melissa Caslick Cheer squad here! Chugged along until Wentworth Falls where I had to empty the stones out of my shoes. (Note to self – buy some Trail Gaiters). Had a lovely chat to a guy who had run the Pace Athletic 22k and was waiting for a friend to appear. Through to the Fairmont where the Ellen Braybon cheer squad was waiting. Grabbed a handful of chips and kept moving. Ran into Tom again in the next section. Really thought he looked familiar… more on that later. 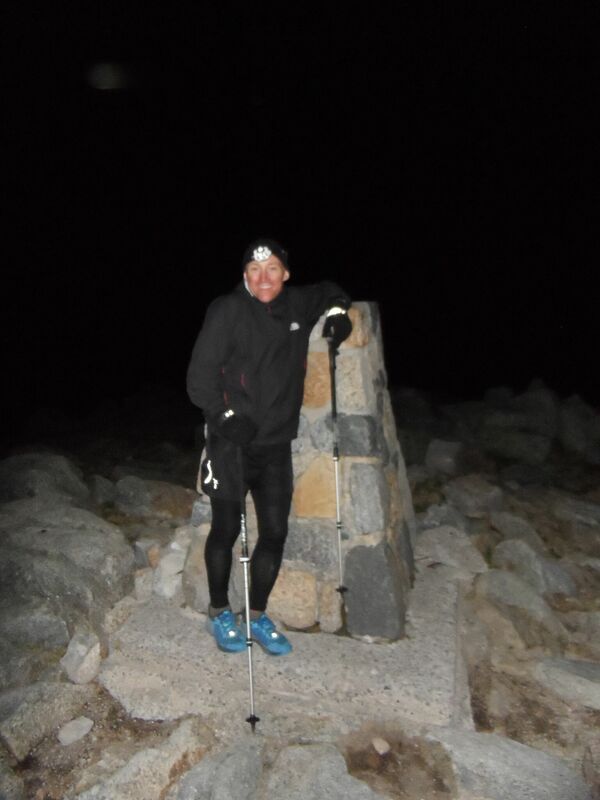 Got to the halfway point and my left knee/ITB was unhappy. 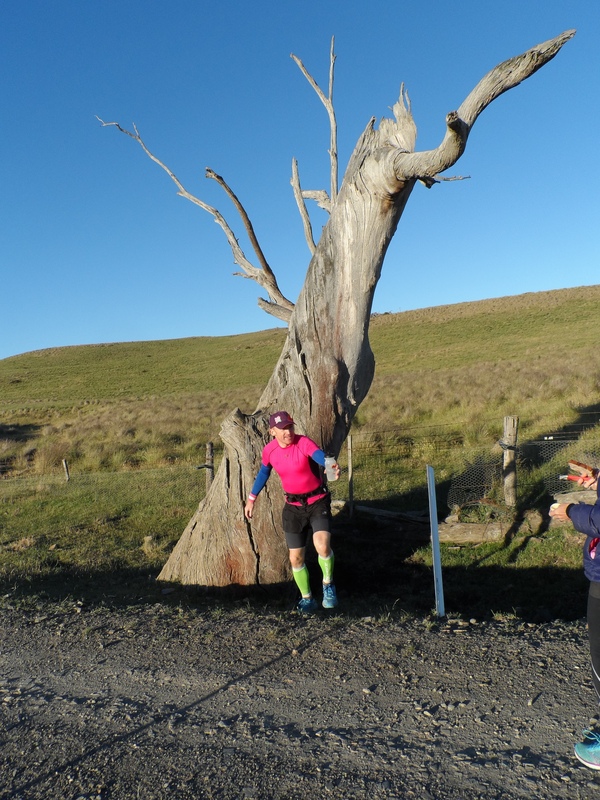 Stopped on Tablelands Road and did some running repairs with my dodgy ankle tape. Sailed into CP1, got a quick hug from Selena, another conversation with Tom, grabbed coke, watermelon and banana, filled up with water, more repairs to the left knee and sailed out again. And then discovered that my little water bottle had been leaking coke into the pocket. Sadly had to drink all the black gold in one go. Struggled down Kedumba with ITB /knee pain – but at least this year I was mostly running rather than walking. There were a few other runners in the same predicament. Got the Jamieson to discover no water in the creek. I was planning to wet my hat here. Walking up the hills I started to pass some of the runners who had passed me on the downhill. Started to crave ice cream at this point. 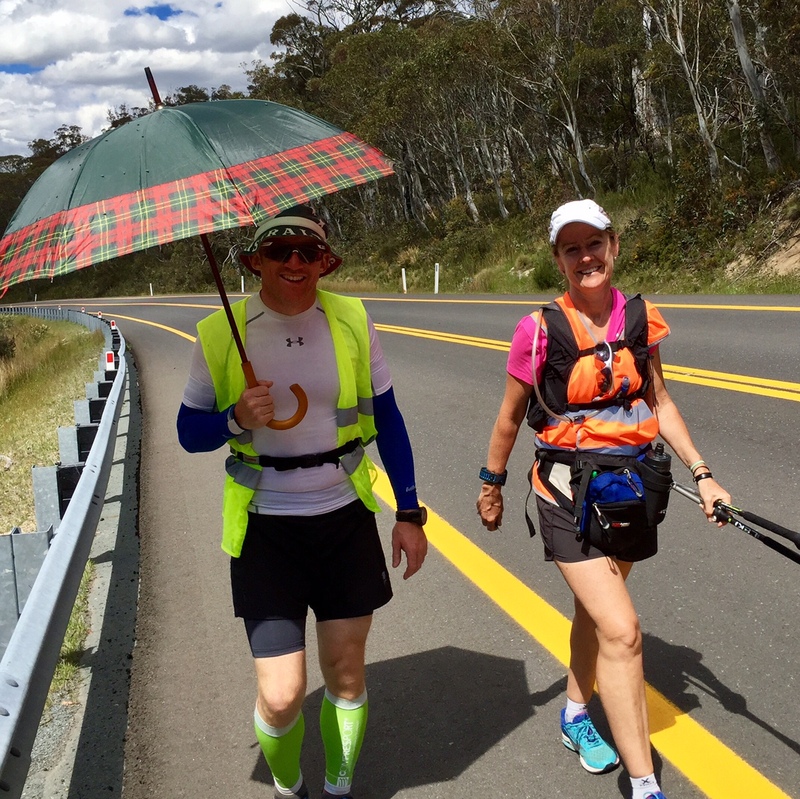 Just before the Leura Creek – I hear – “hey, you’re Adam’s wife Sarah!” It helped that I had my number around to the back…. Had a chat to Byron about how Adam was my husband and left him to it. 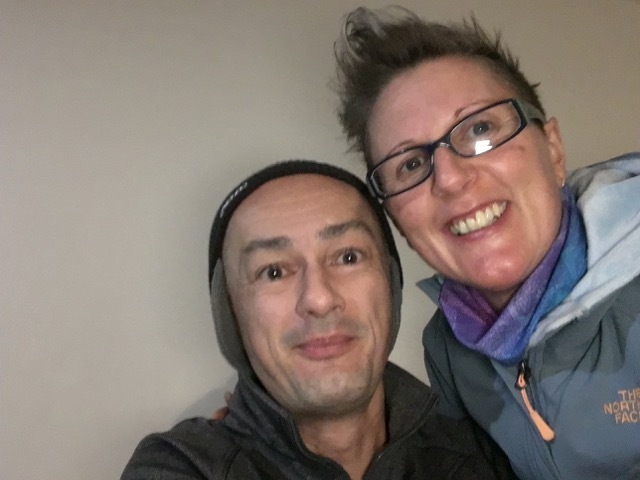 (It’s a running joke in our house – training one day on the UTA course and about 6 people said – “Hey you’re Adam’s wife Sarah”). Get to the 41k mark, rattled my backpack to check if I had enough water – it felt like it. BIG mistake. About a 1k later, wondered why water did not come out of the hose….. No water. No coke. No watery foods. Dismissed the idea of going back. After about another 1k, finally bit the bullet and asked if anyone had any spare water, and Marco came to my rescue by sharing his electrolyte. We power walked the course through the old sewerage works and the mud. 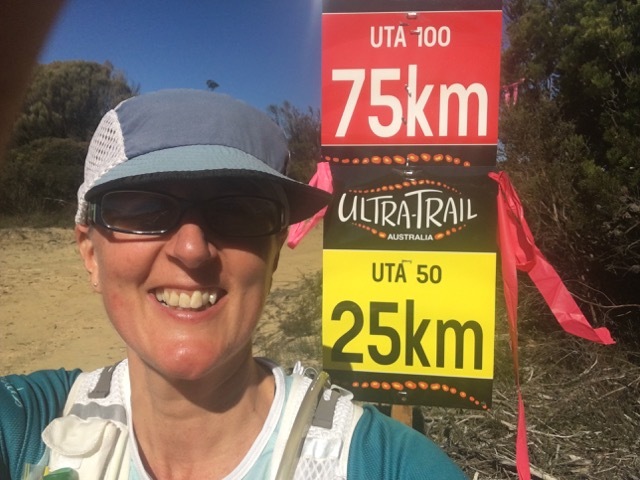 Linda, who I had met during training out the back of Belrose one day, came to my rescue too and filled my leaky bottle with water, which lasted for about 3 k. Marco and I were having a grand old time chatting along this part of the course. Discovered that our kids go to the same school! Got passed by the winner of the 100k – he was very polite and very fast. Then about 30 mins later came the 2nd guy. And then the 3rd, 4th and 5th males … hmm those guys can move. Took my salted caramel GU with about 2 k to go. Marco was making sure I was well hydrated too. And then appears the Furber stairs. Now I’m not a fan of stairs and I knew this was going to be tough. For the first time ever I cramped, which meant I had to put my heel down first on each step to keep my calf muscles long. Finally got to the top and could hear the crowd. 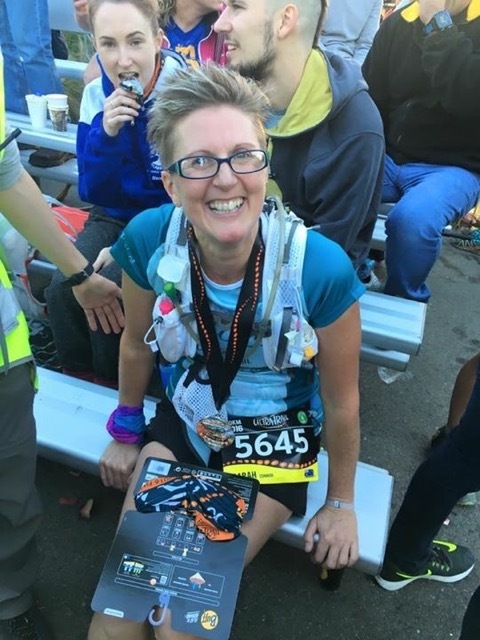 The lady next to me was emotional, so I grabbed her hand and checked on her – it was her first 50k! I managed to run about 2 steps with her and then the cramping started again. It was a walking finish for me. Sat down on the finish line, not quite sure what to do about the cramps. The ever-amazing Jo came and picked me up and got a medic to advise me what to do. So 2 electrolyte tablets, 2 glasses of the Hammer Fizz and a chicken soup later, I was feeling much better. Marco and his family were there and it was lovely to meet them. Marco’s wife checked my time and that was when I discovered I had done a PB by 8 mins. Linda was also there and then all of a sudden, Tom finished and I worked out how I knew him! I had met him with Linda that day in the back of Belrose. Thanks to all my running friends who supported through out the day – it would not be such an awesome race with out the fans ! Thanks to my family who put up with my cranky runner impersonation whilst tapering. 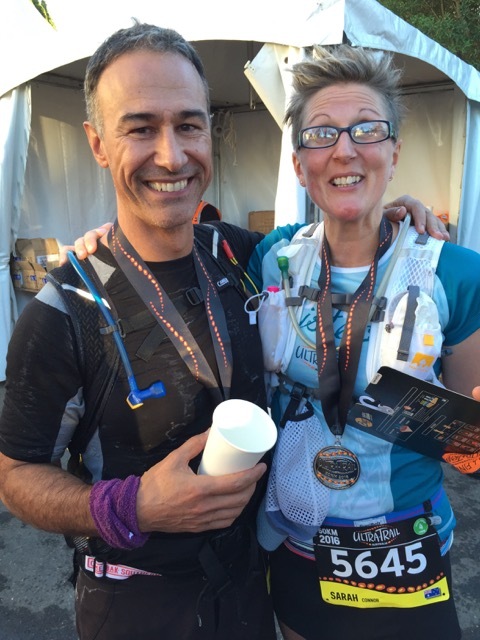 Thanks to Julie, my long run partner – she suffered for this too ! Love the ultra running community! Love this race. 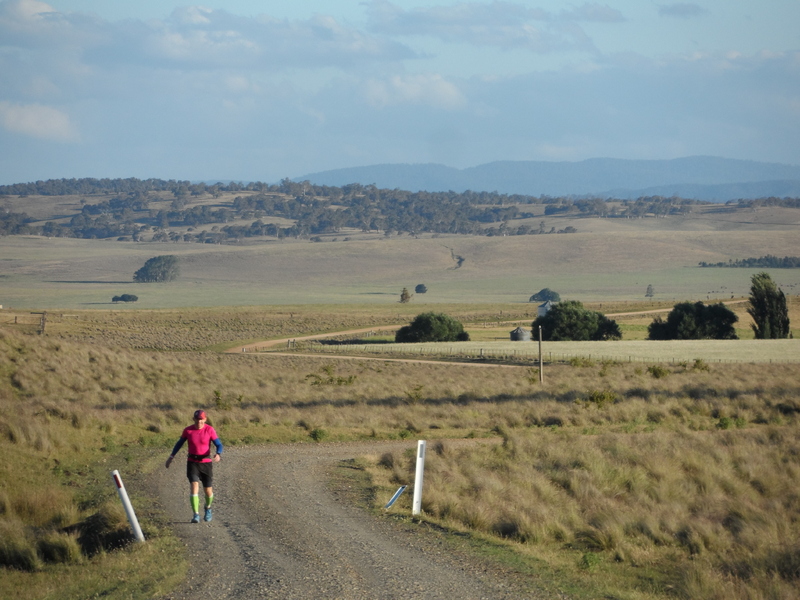 If you are thinking about doing an ultra or just want to have a go at the 22k , this is the race for you. Unknown brand of socks that I got from Pace Athletic and I love. 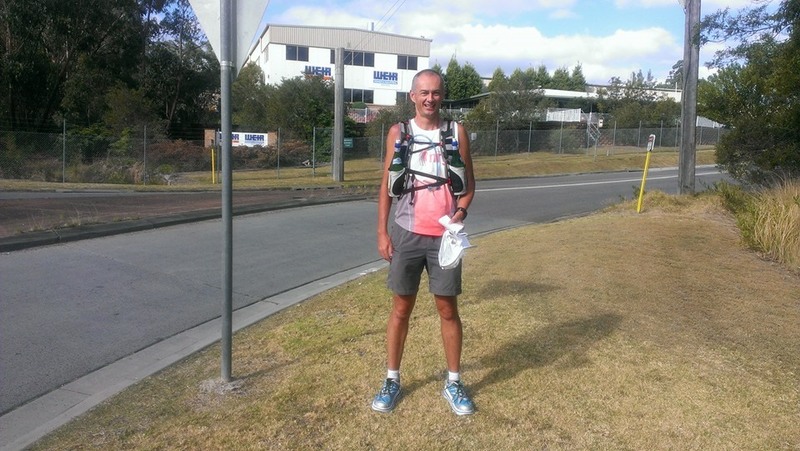 Lulu lemon singlet – in hindsight could have done without it. Summit UTA 2016 Sisters Buff and UTA 2016 t-shirt. Nathan Vapour Shape 2 L/&l hydration pack. Hoka One One Stinson ATR Trail . And boy did I get it wrong this year – could have done the whole course with Coke and chips and baby food. I made a post on the Unofficial North Face 100 Training page late last year, here are all of the links that I could find. This document will get updated as often as needed. Any link with (R) next to the name also does remote training programs via the internet.